Island Peak also known as Imja Tse is probably the most famous trekking peak in Nepal. The height of the summit is 6189 meters above sea level. This peak is the perfect side trip for those who are doing Everest Basecamp or Three Passes treks. It will take you only 2 additional days from Chukung to reach the peak and come back. I did it in 2018, during my Three Passes trek and I can definitely recommend it as a fun way to spend time in Khumbu. On the summit of Island Peak, 6189 meters above sea level. Costs depend on the company you choose to organise your climb. Also it depends if you book it in advance or you just show up in the village and organise everything there. Surprisingly, coming to the village of Chukung and organising everything there is a cheaper option. 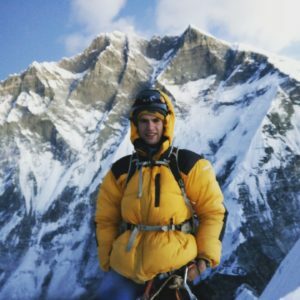 I managed to get the price down to 500$ (+10% service fee if you pay by credit card, so have some spare cash with you if you plan to do the summit) including climbing permit (they just send your passport through viber or whatsapp to Kathmandu), professional guide (who just came down from the mountain), tent in base camp, a lot of good food and equipment I didn’t have – harness with jumar, figure 8 & other stuff, climbing boots, crampons, helmet, warm down jacket and good gloves. It was in the Sunrise Eco Lodge, Chukung and I can recommend their service. 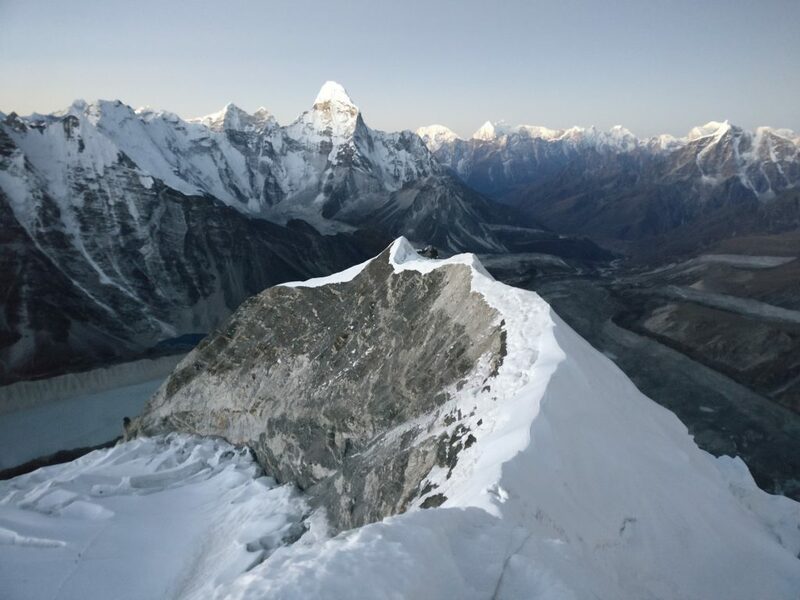 Island Peak climbing costs more if you book it online as some of the money goes to the sellers and advertisement, price for the climb if you book online usually starts from 650$ and goes up to 750$ or 800$. 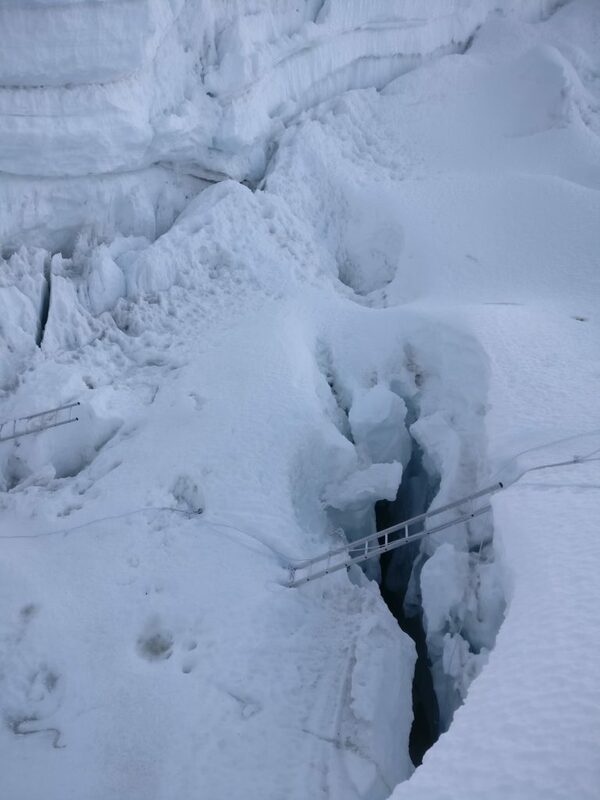 One of the ladders on the way up. Do not overestimate the Imja Tse, it is not an easy mountain. Actually it is not so difficult either, but the altitude you are at makes everything much harder. There are no technical sections and the hardest part of the climb has fixed ropes (which are not so good actually). 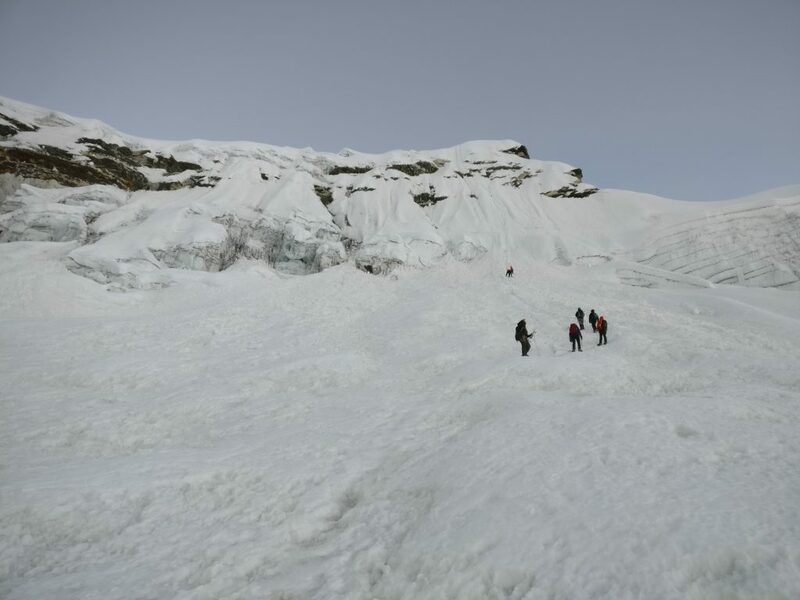 At the beginning it will be a short and easy hike, which will be followed by mix of hiking and scrambling, when you will reach a crampons point some crevices and ladders over them start, fixed lines are after them. Trust your guide, he will take care of everything and make sure that everything is OK. The best time to climb Island Peak (Imja Tse) is Autumn – from September to November (sometimes beginning of December is also good) and Spring – from beginning of March to beginning of June. Be sure than during the peak season – September, October, April, May is full of people. 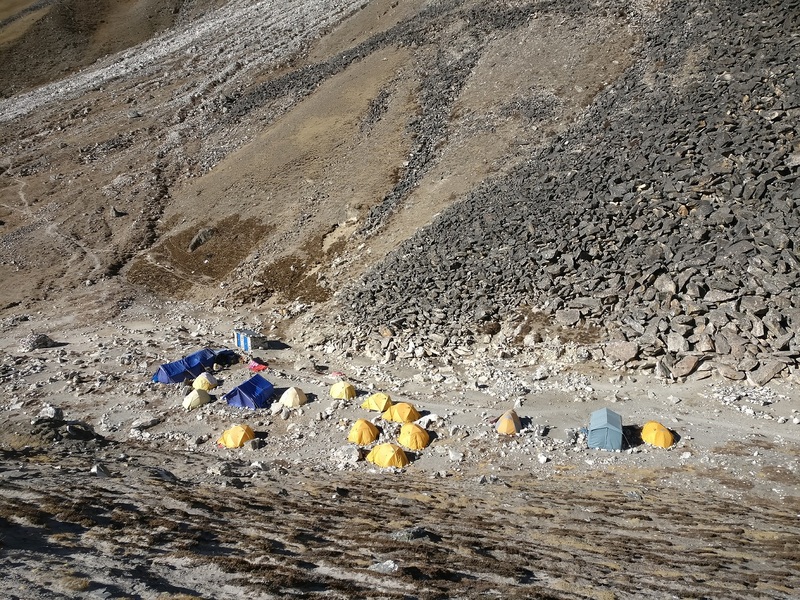 Island Peak Basecamp from nearby hill. Around 5100 meters above sea level. Day 1. No need to wake up early. Breakfast in Chukung, packing your stuff, leaving what is not necessary in the lodge and a short 2-4 hours hike to Island Peak basecamp together with a guide. When you arrive there you are served with lunch, after that if you need the guide shows you how to climb up fixed lines, how to use jumar (ascender), figure 8, carabiners. Then it is mostly free time, you can do a small climb up the hill to see the amazing huge frozen lake with big ice blocks. Dinner time around 5-6PM and as soon as the sun goes down you need sleep as you will need to wake up very early tomorrow. Day 2. Breakfast is around 12:30AM and just after 1:00AM you have to leave for the summit. The cooks will give you small lunch bag to eat on the way to the summit. Depends on your speed and abilities it will take 4-7 hours to reach the summit. I reached it just before the sunrise at 6AM. Summit photos, enjoying the views and then long descend back to the basecamp. When you will reach the basecamp cooks will make you small lunch, you can rest some time and then you will need to hike 2-3 hours back to Chukung. Early morning and some people on the way to the summit. Death rate for Imja Tse is pretty low, but sometimes it still happens because of the mistakes made usually by clients who didn’t have climbing experience before. Generally, the mountain is very safe just make sure to follow what your guide says. Ladders you will need to climb up and down. Conclusion. The climb of Imja Tse is definitely worth a go if you have time during your EBC or Three Passes trek. It will probably be your highest Peak for just 500$! Make sure you have the insurance which covers the helicopter evacuation at this altitude if something goes wrong. Also, don’t push too hard if you feel the symptoms of AMS and make sure you had the proper aclimatisation before the climb. Enjoy it! Hey! Thanks for reading. I am Joseph - young guy from a small country called Lithuania. Haven't heard about that? No surprise for me, we are only 3 million people. I am sports addict, mountains climber, travel blogger, adventurer and digital nomad, making my way around the world while building successful online businesses. Are you looking for more travel advice? Check other articles! Wow- this looks amazing. This kind of mountain climbing has always fascinated me. I could never do it- but those who can do it are incredible! Thanks for sharing your journey! Elizabeth, it definitely is amazing! Try it one time. Toubkal would be a great option for your first time. It is in Morocco and reaches 4167 meters. You can check out more about it here – https://nomadjoseph.com/climbing-jebel-toubkal-without-a-guide/ . Looks cool! Now if only I didn’t get dizzy on a chair! 😀 That leader looks terrifying. I had to climb one the other day in my room, and that was difficult enough. I can live through posts like yours, at least. Yup, the ladders are pretty high. And you need to climb up and down them with crampons! Island Peak climb is definitely amazing experience in Nepal 🙂 Thanks for kind words. Incredible photos! I can only imagine what it’s like, but your post really gives me a sense of actually climbing a mountain. It looks super adventurous! It definitely is! I didn’t like the part that I had to climb with a guide and rented equipment, not my own. But that’s better than nothing especially when you are in Chukung village which is pretty high above sea level without any equipment and plans. Kudos to you, I don’t know if I can climb a mountain, and it has snow/ice…that’s an added pain, but I guess it is worth it. The basecamp looks so tiny from above. Laurence, thanks for kind words! You definitely can climb a mountain. For the first time it shouldn’t bee one of 6000ers in Himalayas, but you can climb one of a smaller peaks wjhich reaches 2000-4000 meters. And yeah, the basecamp was quite small, because it was almost off-season. Last days of the climbs. Oh yes, Amy, the climb to Island Peak was definitely one of my favorite things in Nepal. Actually, the 500$ fee for climbing Island Peak with a guide is only available if you arrive to Chukung village. If you want to book it online it will cost much more, starting with at least 750$. The climb wasn’t really difficult, because there are fixed lines. Also, you have all the safety equipment and a guide with you. 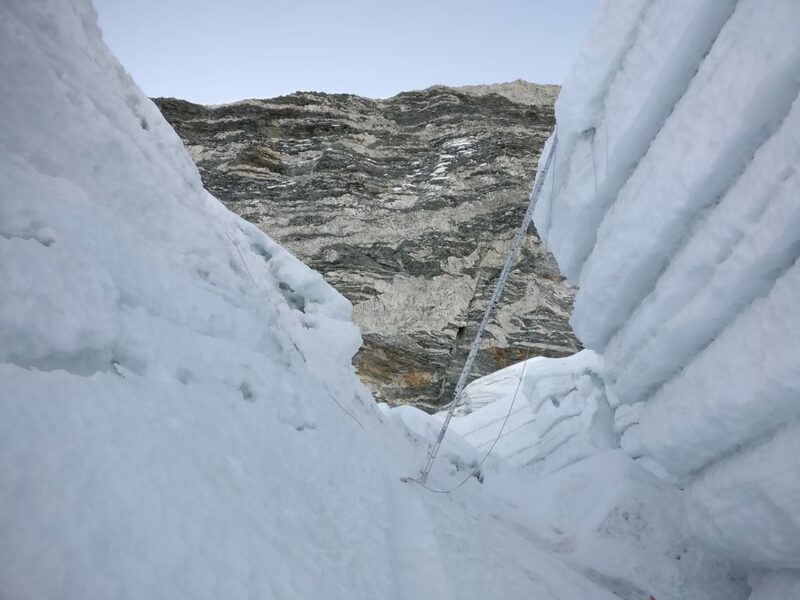 Besides that, you arrive to the basecamp already acclimatized, because usually you need around 5-10 days to reach Chukung, depends where you start. Wow, the views are so dramatic and gorgeous! I love it. Definitely worth waking up early on the second day. Thanks for sharing your tips. Were there a lot of people on the same day as you? It is not that bad, Zenja! If you want to climb the peak and return to Chukung in the same day you definitely need to wake up early. On the same day when we climbed Imja Tse there were only ~10 more tourists. It was almost end of the season for climbing Island peak. Wow. I am super awed by you. I would not have been able to survive this. It looks fantastic though. The list of things one would need for this is super helpful especially knowing what the tour company will give and what we have to bring. Thanks, Renata! Pictures are made just with my phone, so the quality is not so good. Yeah, the altitude is pretty serious. Until this peak my highest point was 5670 meters in Iran so it was more than 500 meters higher. If you do proper acclimatization you shouldn’t feel dizzy in the mountains. What an adventure! I don’t think I would ever be fit enough to climb this peak but the views at the top definitely worth the effort! If you haven’t done mountain climbing before you might need to start running longer distances, hike some smaller mountains. Then raise the elevation slowly until you can do higher peaks like Imja Tse in Nepal. If you really want it – it is definitely possible. I would love to be able to do this, it looks incredible but I’m not sure I’d be able to. I think I could put in the effort, I just think I’d turn in to a bumbling mess when I got to the ladders! Hey Paul, the ladders are probably the sketchiest part of the climb. To climb up them during your Imja Tse attempt with crampons is pretty hard and scary. Also you need to get down them with the same crampons which make your climbing boots not stable and much bigger than they really are. I wish I could even attempt to do something like this! What an inspiration to you are to all. The views must be just simply amazing! The views are really great. From the top you see one of the highest peaks of the world. The mountain looks nice but I am not sure I could bring myself to climb it. I mean I’ve never climbed any mountain before so I don’t think I would start with this peak more so in that coldness. But I would maybe go there to enjoy the views and take like a million photos. But I like how you described the entire process, it is great info for any planning to go mountain climbing. Esther, this summit is definitely not for the first timers. You need to have experience and I definitely recommend to climb lower peaks before attempting something like this. But yeah, you are right, the views there are amazing! Previous story Wadi Rum Desert – What to do, see and Where to go?